Do you see anything abnormal? Is there something unusual about him? 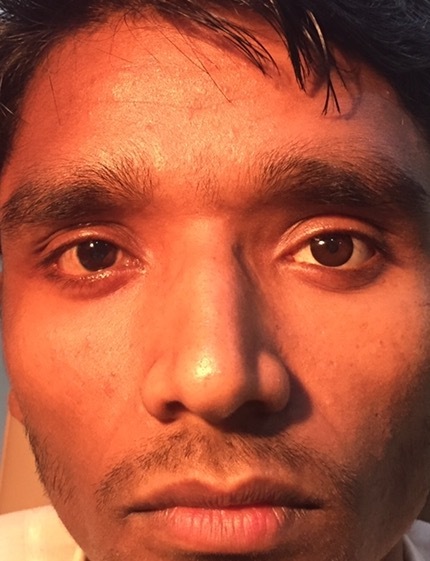 This is the story of Manu Singh who came to us with a history of trauma to the left eye. 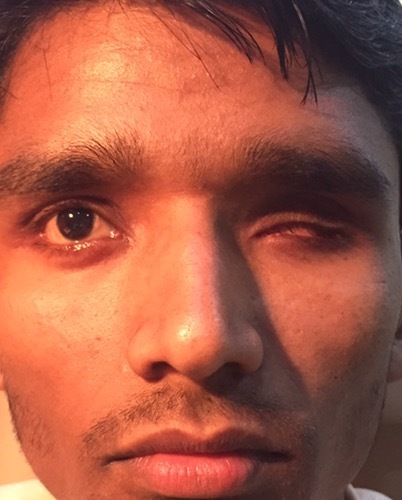 He underwent a series of procedures and surgeries and was using up to 6 different eyedrops in his left eye. However, the damage was irreversible and unfortunately that eye lost all vision and soon became a small, shrunken, disfigured eye. Where ever he went, he faced questions about how one of his eyes looked smaller than the other; children would run away, and Manu started avoiding the company of people because of his appearance. Soon, he lost all his confidence and self-esteem. What condition did he have and what treatment did he undergo? Manu had a condition called Phthisis bulbi. It is the end-stage ocular response to injury or severe disease of the eye. The chances for recovery of vision are zero and in addition to the stress of having only one, patients of phthisis also face cosmetic issues. Manu came to us with the hope of having better cosmesis and looking normal once again. He knew that vision could not be salvaged but he hoped to look like everybody else. After a thorough examination and after explaining all the options available, an evisceration surgery was performed. In this method, the jelly-like fluid inside the eye is removed and an orbital implant was placed. An implant gives a spherical shape to the orbital contents and restores the lost volume inside the bony socket. A prosthetic eye or artificial eye is usually made of hard, plastic acrylic. The prosthetic eye is shaped like a shell and is customized to ensure perfect fit. The prosthetic eye fits over an ocular implant. The ocular implant as we mentioned earlier, is a rounded object that is surgically embedded deeper in the socket to impart volume to the bony orbit. 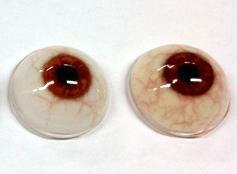 An artificial eye or the ocular prosthesis is generally made at least six to eight weeks after surgery. This time is necessary to allow for the swelling to reduce and also to allow the socket to heal. How is a prosthesis different from a normal eye? A prosthesis is an artificial eye. It does not bring back the lost vision/eyesight. A prosthetic eye can move, but often as much or as well as your other healthy, normal eye. The small hole in the centre of the dark part of the eye - the pupil in a prosthetic eye does not change shape in response to surrounding brightness. So, it is possible that the pupils of the two eyes may appear unequal in size. Manu now has got his zest for life back and now plays with his 4-year-old nephew like before, not worried about how the world sees him. Manu now has got his life back. If you or someone in your family can benefit from an ocular prosthesis, consult an oculoplastic surgeon soon. Dr. Akshay G Nair is a fellowship trained oculoplastic surgeon. After completing his residency at Sankara Nethralaya, Chennai, he trained at L V Prasad Eye Institute, which has trained some of the best oculoplasty surgeons in India. He has published more than 30 papers in peer-reviewed journals in national and international journals. He frequently serves as a reviewer for 8 journals. He practices at Advanced Eye Hospital and Institute, Navi Mumbai which is one of the best eye hospitals in India. You can click on the link below and get an appointment with the best super specialist doctors of Navi-Mumbai. If you are suffering from any problem with retina or just want to know more.